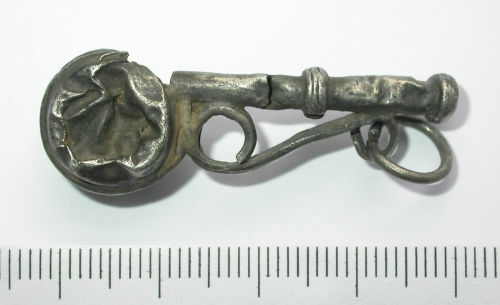 Silver "bosun's" whistle. Slightly tapering sheet tube with two applied transverse double-grooved fillets, one at the widest end and one at the centre; at the narrower end is a hollow cast sphere which has a circular hole (diameter 5mm) cut at the junction with the tube - air blown through the tube would pass over this finger-hole. Around the sphere is an applied flat band decorated with three raised ribs; it runs from the far edge of the finger-hole to the underside of the tube. Flat-sectioned S-shaped handle soldered at two points to the underside of the tube, and also to the inner edge of the sphere's band; single circular loop suspended from the handle at the wider end of the tube. The underside of the handle is decorated with three raised transverse ribs, mimicking the decoration on the band around the sphere. The tube is cracked and slightly bent towards the narrow end, and the sphere is squashed inwards on one side and dented on the other. 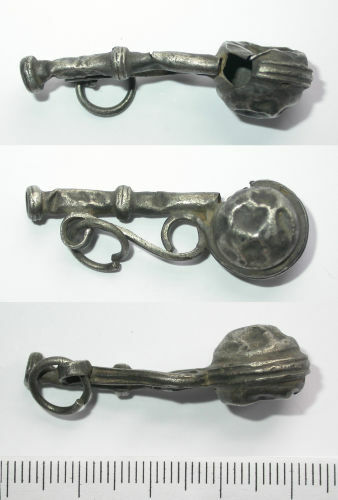 Dimensions: Length 41.3mm, length of tube 28mm, diameter of sphere (not including decorative band) 12.5mm, width across sphere 11mm, thickness (height) 14mm, internal diameter of wider end of tube 3mm, weight 4.32g.